Kidney prepared in just 45 minutes! The mPrep™ System uses mPrep capsules to prepare specimens and grids for electron microscopy and other applications. mPrep capsules connect to lab pipettors just like pipette tips for convenient processing in any lab. Use mPrep capsules with the programmable mPrep ASP-1000 Auto Specimen Processor for “hands-off” preparation of specimens and grids with any protocol. mPrep/s capsules entrap specimens for transmission and scanning electron microscopy and other sample preparation. 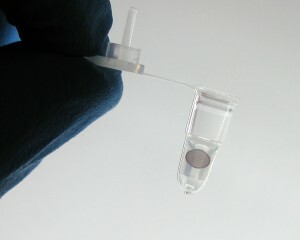 Capsules hold specimens throughout fixation, embedding, and sectioning. The mPrep Workstation orients specimens in mPrep/s capsules and streamlines workflow from dissection to reagent processing. Encapsulated specimens are protected from loss, misidentification and damage. Quality reproducible results are achieved with a fraction of the effort. Your browser can’t play videos! mPrep/g capsules hold TEM grids throughout staining, immuno-labeling and storage. Grids are protected from loss, misidentification, and damage. Grids may require handling only twice: when inserted into capsules and when placed in the TEM. Grid-Tite™ slots keep grids safe even if an open capsule is dropped. Reagent consumption is as little as 20 μl per grid. You may never lose or damage a grid again.